In 1968, there was a popular film entitled “The Shoes of the Fisherman,” about an archbishop from Ukraine — a former political prisoner who is elected pope. On the evening after his election, he sneaks out of the Vatican dressed as a simple priest to explore the city of Rome. He declines to wear the papal tiara. He undertakes to sell the church’s property to relieve a famine in China, and encourages wealthy nations to follow his example. Ten years after the movie was released, people would have been struck by how it prefigured St. John Paul II, another down-to-earth pope from Eastern Europe, who spent much of his reign dealing with communists. Today, it’s the simplicity of the Anthony Quinn character (Pope Kiril) that stands out. Pope Francis was here, at the Catholic University of America, recently, and I found myself thinking of his humble black shoes and of the modest Fiat 500L that picked him up at Joint Base Andrews, when he first set foot on American soil. These are not just symbolic gestures by Pope Francis, who lives in a modest guesthouse rather than the Apostolic Palace. After his election, he returned to the boarding house where he stayed during the conclave, to pick up his luggage and pay his bill. As archbishop of Buenos Aires, Argentina, he rode the bus, cooked his own meals and lived in a run-down part of town. People are drawn to the pope because of his lack of pretension. Ordinary folk can identify with a man who walks in their shoes and rides in a car like the one they own. The big event during the pope’s visit to Washington was an outdoor Mass, which he celebrated from the portico of the Basilica of the National Shrine of the Immaculate Conception. The congregation, 25,000 people, gathered on our front lawn at Catholic University. En route to Mass, the pope rode around the campus in an open car. He reached out to touch students; he even mugged for pictures. Pope Francis has a different appeal than rock stars and presidents. People who shake those hands don’t just imagine they’ve had a brush with greatness; they feel somehow ennobled by the contact as well. The attraction of Pope Francis is rather that he seems so human, so like us. He seems to make holiness a realistic aspiration for ordinary people. This is not to say that popes or, for that matter, lawyers who live less modestly are morally culpable. Popes have worn red shoes since the 16th century, and at least a few of them are saints. St. John Paul II (for the record, he wore brown shoes) sometimes rode in an SUV with bulletproof windows, for good reason: He was shot in 1981 while riding in an open Fiat popemobile. Fancy clothes and cars have their place. What bride would want to go down the aisle in Dr. Martens brogues, or ride to her wedding reception in a hoopdi? But the world, especially the West, needs the example Pope Francis is setting. Ownership of material goods is not intrinsically evil, but all the stuff we have can distract us from the love of God, which ought to command our attention. In “The Divine Comedy,” Dante put many popes and cardinals among the greedy in the fourth circle of hell. The damned souls there are so preoccupied, jousting with weights (depicted in later art as huge moneybags), that they do not even notice the presence of Dante and Virgil. But we did notice the visit of Pope Francis last week, precisely because he paid so little attention to outward show. He gave new meaning to walking in the shoes of the fisherman. 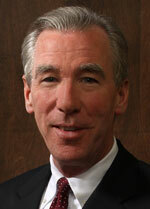 Garvey is the president of The Catholic University of America in Washington.